If a tree falls in a forest, does it make a sound? If someone writes a blog and nobody reads it, does it exist? Getting people to hear your message has always been a challenge but as well as the traditional methods such as Press/Direct Mail/TV there are now a number of other channels which bring with them a different set of rules. Over 6,500 Likes and Over 1,300 Comments! 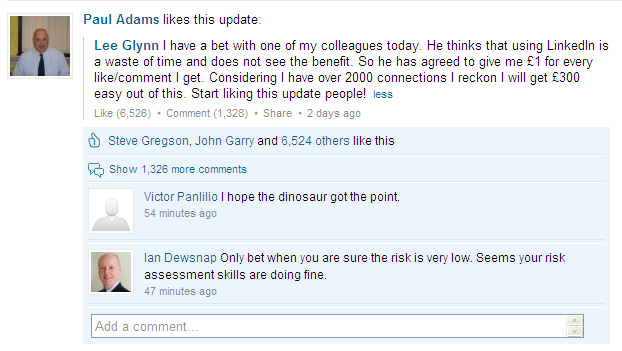 The sheer volume of likes and comments on this update show how a comment or update can travel far beyond your own sphere of influence, after all, one of the principles of LinkedIn is the 6 degrees of separation where we are all connected somehow and ‘my connection used to work with you’ sort of warmish leads. Each person who is connected to one of the 6,526 people who liked the post would have seen that as an update from that connection (as I did when my connection liked the update), so if you think of all the people who saw it, but didn't bother liking the update there were probably tens of thousands of people who saw that update. Getting a Like on a status update such as the one above reminds me of an episode of the Simpsons where Bart’s teacher Mrs. Krabappel gets passing motorists to honk their horns, seemingly in support for the teacher’s strike but in reality the placard she’s holding says ‘Honk if you love Cookies’. Getting a Like (or a retweet) on a more sober business related message is harder but if it’s interesting enough people will pass it on as they’ll want to be generating useful content for their followers and there’s only so much content they can generate themselves. If you can prove to be a useful filter of all the noise that’s out there then people will value what you say whether it’s related to your own or someone else’s content. The most important thing I’ve learnt though is if you don’t ask you don’t get, so please like/retweet this blog and help to prove that point. Our next blog will look at the ‘half-life’ of a tweet/status update and how to maximise the value of your activity to increase the proportion of your followers that see your message.